Enter your email address below to receive a notification when One Heart Coffee starts accepting new sign-ups! Enter your email address below to receive a notification when One Heart Coffee is accepting new sign-ups again. Order by X, and get it by May 11th! Boxes ship the first week of every month. 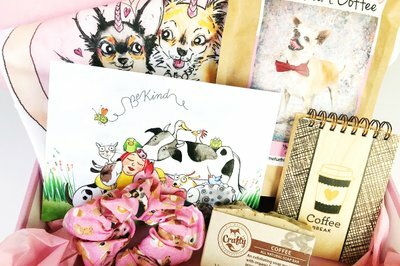 Subscription Box For Coffee/Dog Lovers! 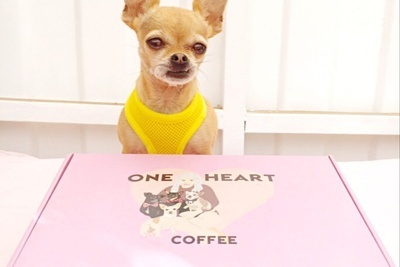 One Heart Coffee is a cruelty free, vegan subscription box for coffee/dog lovers.. Each box has a .8oz bag of coffee with adoptable dogs on the label and a monthly shirt. We also hand pick items that fit our theme to add to the box. 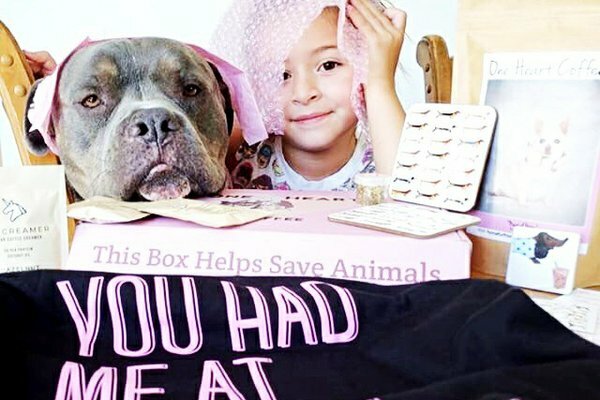 Each box donates $1 to rescue and features adoptable dogs. 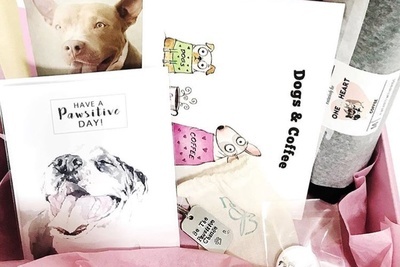 Organic Coffee, Quality Shirts, Donates to Rescue, Adoptable Dogs on Labels. I am absolutely in LOVE with my April box. Just having the box has made a difference in my self care routine, which I really needed this week. I used my bath salt for the first time last night and it left me so relaxed and I slept great. I think my favorite product might be the moon majic aches pains and soothing oil... I literally have it by my bed and I put it on at night when I find myself complaining about my aches and pains after a long day at work. It really does make my muscles feel better!! The one heart coffee is always fabulous , I love love love the flavor and quality. And the fact that it is helping save dogs lives. I used the mud mask last night and it literally made my skin so tight. I really love the face wash too. I would buy everything in this box again and These items are also things I would recommend to friends or give as gifts because they are of such great quality. I haven’t used the washcloth yet but it is so cute and I love the way it smells. I am a 3 month prepaid member and can’t wait to see what’s coming in May!! Attention all animal lovers !!! This is absolutely amazing ! Not only what the box stands for but also because it’s has amazing product inside ! I honestly love everything that comes in the box especially the shirts! Also a part does go to recues so i love that as well. Honeslty this box will make you smile once you open it. I love 💗 supporting small businesses and anything animals! I have bought 2 T-shirt’s and they are so soft. They fit well and I love the sayings. I wear them all over LA. I can’t say enough how comfy and soft they are. I highly recommend buying some. I love the fact that this small company supports dog rescues and it makes it so much easier to support them, plus you get an awesome T-shirt. One Heart Coffee is my favorite subscription box! Yummy coffee and also supports the shelter dog community. It doesn't get better than that! Every item in the box is selected with love and care and is high quality. The coffee is delicious and the tshirts are great with their cute dog related sayings. Included also are hand selected items like candles and different dog related items. Loved that this month there was a Boogie Shoes 2019 calendar. I follow Boogie Shoes on FB and IG so was super happy this was included this month. 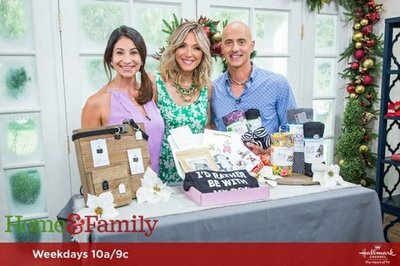 I highly recommend this subscription box and am grateful to Kat for starting it! Keep up the great work! I honestly can’t say enough good things about one heart coffee’s boxes. I love subscription boxes but I’ve never experienced anything like this. When you open a oneheart coffee box you can immediately feel all the love and thought that has come into it. It just makes you happy! Every item is so thoughtful and fun. By purchasing a box your not only giving yourself (or someone else) a great gift but you’re also helping rescue dogs! What’s better than helping local businesses, female empowerment, self care, and rescuing animals...all at once?! So happy to have found one heart coffee. I’m a fan for life! Adorable shirt and great cause! I love the shirt I purchased from One Heart Coffee. It was the perfect gift for my soon to be mother-in-law. She adores it! Thank you, Kat. Keep on saving dogs!